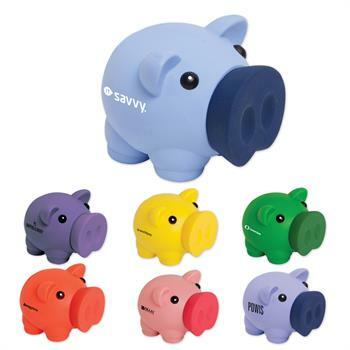 Encourage savings in the young and old alike with this durable PVC piggy bank. Simply remove the snout to retrieve the money. Available in 6 colors. A great teaching tool for children and adolescents, whether at home or in school. Ideal for tradeshows, conferences and promotional fundraising events. Its convenient 4" x 3" size makes it a good fit as a tote bag insert or customer gift. Available in blue (S16156X), green (S16157X), orange (S16180X), pink (S16155X), purple (S16181X), light purple (WL1079X) and yellow (S16158X).